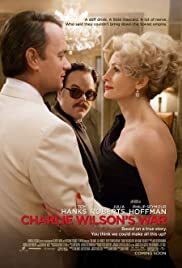 A drama based on a Texas congressman Charlie Wilson’s covert dealings in Afghanistan, where his efforts to assist rebels in their war with the Soviets have some unforeseen and long-reaching effects. BEFORE: My choice of Charlie Wilson’s War has a few motivations behind it. There was an opening before I start some major chains over the next few weeks (look out Tarantino, Best Picture winners, and Westerns). Also, this film is written by Aaron Sorkin, whom I’m a big fan of. His new show The Newsroom is fantastic and Amazon just added The West Wing to Prime Instant video which will now be occupying a large chunk of my time. AFTER: I am a big fan of films that are based on a true story. It gives me a chance to learn something about history and they’re also entertaining. I know of the Cold War but I really don’t know a whole lot about it; many of the war films I’ve seen have to do with WWII or Vietnam, no communists. So to see a story about how covert operations played a part in ending the Cold War is a new experience for me. As expected from Sorkin writing, the film was very fast paced and involved lots of witty dialogue. It works very well, especially in a war film like this where in reality it took years and lots of long meetings to get stuff done. The fast pace and dialogue still retains a sense of time but it gets through things quick enough to keep you wanting to find out what happens next. My, minor, issue comes with the ending of the film. Whenever you begin a story with the ending, you’re fighting an uphill battle. If the viewer already knows what happens, how can the story still be interesting and entertaining? Aaron Sorkin finds a way to combat this issue but I’m not sure it’s enough. First off, the ending seems very abrupt; as if one day the war was happening and the next the Soviets surrendered. That may be how things happened in real life but it just seemed to unrealistic to me as a viewer. Sorkin combats this by introducing another element that is not shown in the beginning (e.g. the first time the ending is shown). It makes for an ending I wasn’t quite expecting but it doesn’t help with the abruptness that left me a little skeptical.